There’s a decent chance you’ve never heard of Betonline Poker but it’s actually one of the fastest growing sites in North America. Although it doesn’t compare to some of the heavy hitters in the industry, Betonline Poker actually punches way above its weight class by offering decent software and very soft games. It’s getting harder and harder to find good games online but Betonline really does offer some surprisingly weak players. It probably helps that the site also has a massive Sportsbook and there are definitely some gamblers looking to try their hand at poker on the site. 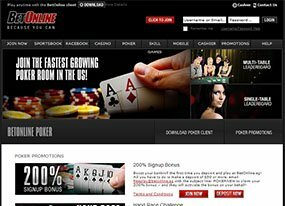 Betonline currently resides on the burgeoning Chico Poker Network. CPN offers two US-friendly sites (Betonline and Sportsbetting.ag) in addition to the internationally-focused TigerGaming. CPN has succeeded primarily because it offers action to US players and offers softer-than-average games. Betonline Poker also utilizes software from Connective Games, which is generally considered quite solid and works on Windows, MacOS and mobile. CG also provides software to Latin American Giant Aconcagua Poker. The site offers a fairly standard mixture of games with No-Limit Hold’em, Pot-Limit Omaha and PLO Hi-Lo. Betonline also offers a special Sit & Go game called Windfall Poker. Another standout feature of the site is the enormous bad-beat jackpot, which regularly awards prizes that top $100,000. Betonline also offers a slew of promotional offers with $10,000 freerolls for new players and a substantial refer-a-friend program that can be lucrative to players who have a lot of poker-playing friends. Perhaps most importantly Betonline has historically had fast payouts with reliable support. The site also boosts one of the highest credit card acceptances in online poker as well as support for Bitcoin. You aren’t going to find a ton of obscure games on Betonline Poker as the site is primarily all about Hold’em and Pot-Limit Omaha. Interestingly Betonline does offer PLO Hi-Lo and the games are relatively well stocked so that’s a nice addition for players looking to experience poker beyond the big two. On the tournament side Betonline offers Windfall Sit & Go’s, which are fantastic for new players. Windfall Sit & Go’s follow a jackpot-style format where winners get a randomized prize that that is many times the actual buy-in. Windfall Sit & Go’s can be a great place for new players because there is a fair amount of luck involved in the format and that can help protect rookie players from the sharks. Hitting the jackpot is always a legitimate (if faint) possibility. It’s not exactly poker but Betonline also has a fantastic sportsbook for players looking for something a little different. Betonline Poker offers support for both Android and iOS platforms. With Android devices such as tablets or smart phones you can head over to the Betonline home page and simply scan a QR code to download and install standalone software. The process is relatively simple but it does require Android OS 6 or higher (which shouldn’t be a problem if your device is from the last five years). On the other hand Betonline Poker does things a little differently for iOS devices with browser-based software. You can still scan a QR code on the Betonline home page but you’ll instead be routed to a web browser version of the Betonline client. Both mobile editions work fairly well, although the desktop client is definitely a better. One thing that’s sadly missing from Betonline is any form of Fast-Fold poker. Fast-Fold, which gives you a new hand the instant you fold, is a perfect fit on mobile because you can play a lot of hands on just one table. Betonline has a few interesting promotions to incentivize new players and a rewards program to match. For years Betonline didn’t actually offer a sign-up bonus for online poker players (it was relegated to the Sportsbook) but recently it opened up with a traditional deposit match where the room will match 100% of your initial deposit match. That means means you can potentially earn twice what you deposit on a site if you manage to get through the playthrough requirement. Beyond the sign-up bonus Betonline also offers new players a ticket into a free $10,000 tournament. Players tend to ignore these sign-up tickets but this is actually a great perk for signing-up at Betonline because the fields are generally quite small and there’s a legit possibility to win a nice chunk of cash. Another nice feature of Betonline is that players get up to 60 days to unlock their sign-up bonus. Most sites cut players off at 30 days. Finally Betonline offers incentives for loyal players in the form of Comp Points. Every time a player enters a real-money tournament or cash game they are earning Comp Points. The points can be utilized to enter tournaments with real cash rewards. The program is quite simple and you won’t see any of the tier rewards you get on competing sites but it’s better than nothing. Betonline Poker is still in the process of establishing a diverse tournament schedule but the site already has a few standout events. The event that will grab most people’s attention is the big Sunday Major, which has a guarantee of $75,000. The buy-in is just $109 so there’s definitely potential for some serious return on interest. There are actually a series of Sunday Majors side events with buy-ins ranging from $1.10-$55 and guarantees that go up to $25,000. Those events happen every week but Betonline also features a series of 12 daily tournaments called the Daily Dozen. Buy-ins range from $11 to $109 with guarantees from $1,000 to $10,000. There’s also a Mini Dozen with twelve more tournaments with even smaller buy-ins. Finally Betonline has also gotten into the recent trend of bounty tournaments with both Progressive Knockouts and Bounty Builders. In bounty tournaments it’s possible to earn plenty of cash without even winning. You just have to knockout as many players as you possibly can. While the overall schedule of tournaments on Betonline is relatively small it’s been growing fast and there are definitely some good values to be had on the site.